20 [When they were finally tired of mocking him, they took off the purple robe and put his own clothes on him again.] Then they led him away to be crucified. 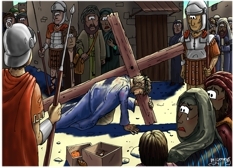 Mark 15:1 states that the trial of Jesus, before Pontius Pilate took place , “Very early in the morning.” Mark 15:28 states that the crucifixion of Jesus took place at 9am. Therefore, this scene is set after dawn, but before 9am. The sun is already high in the sky & shining down on the flogged body of Jesus, who is carrying the wooden cross that he will be crucified on. In this scene, he has stumbled & is on his hands & knees. Jesus, carrying the cross. Roman soldiers (in metal & leather armour, carrying spears) & a crowd of Hebrew on-lookers. In the background, on the right, we can see various religious leaders, looking pleased that Jesus is going to his death. Notice the 2 mice, along with an old over-ripe Orange in the foreground boxes! 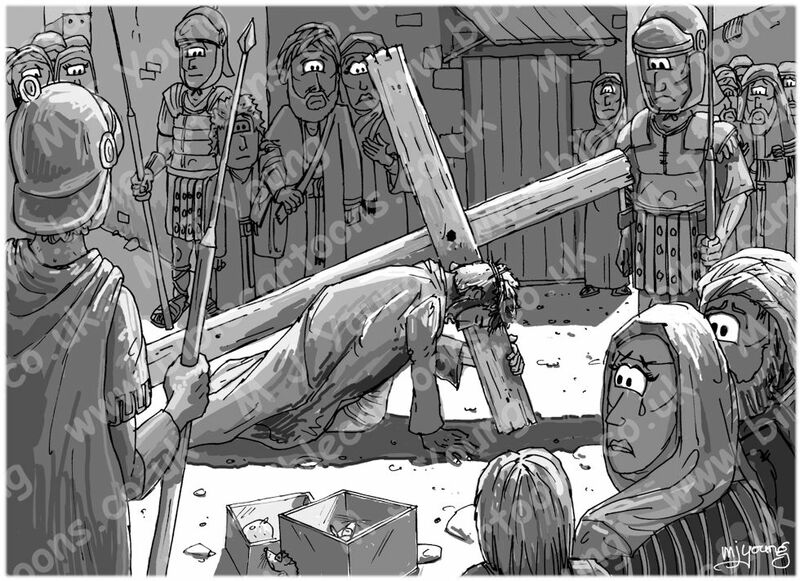 This scene occurred within the walls of the city of Jerusalem, whilst the crucifixion occurred on the hill called Golgotha (meaning “place of the skull”), which was outside the city’s walls. Whilst the religious leaders possibly felt threatened by Jesus (& the kingdom of God) the common people loved Him: his personality, his teachings, & his miraculous, healing powers. That is why I have drawn the religious leaders as smiling, but the crowds are tearful & sorrowful, as Jesus is being led to his death. 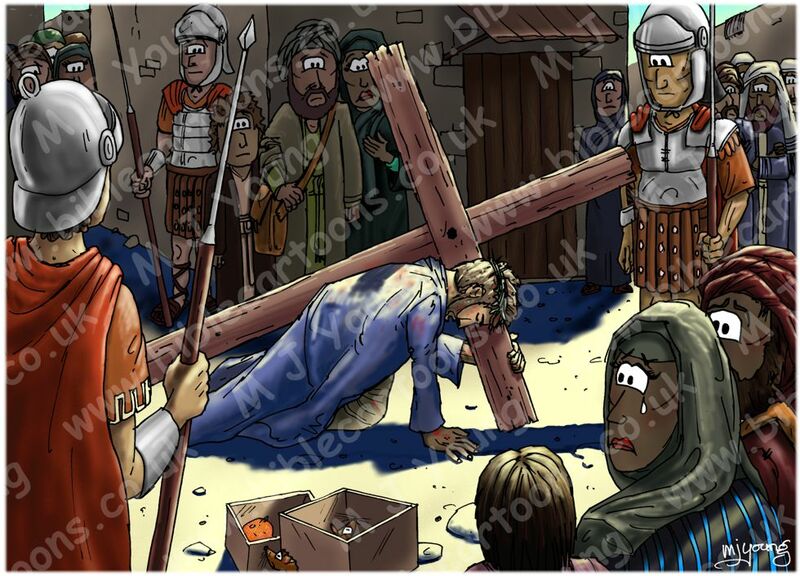 It may be difficult to see in this smaller version of the scene, but I have included some blood seeping through Jesus clothes, & on his face & hands, which is a result of the flogging the Roman soldiers gave him, prior to his crucifixion.